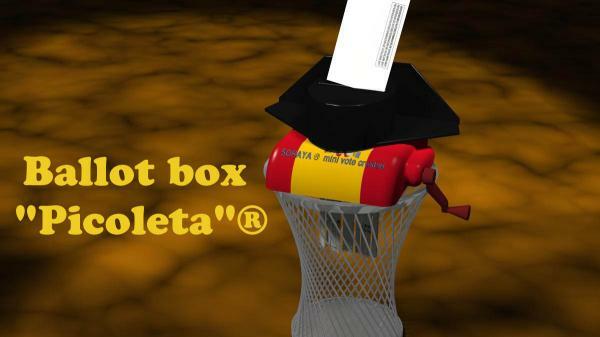 3d model of a fantasy ballot box. According to generally well-informed sources, an electoral ballot similar to this would be about to be approved by the state government for the referendum on self-determination of Catalonia. It really is a joke, it would be more fun if the fundamental rights had not been violated. It is a serious matter. With textures. In .obj format and packaged for Poser. Crawler76 (7 months ago) Inappropriate? Pedro Caparros (7 months ago) Inappropriate? @ Crawler76 Vale, queda claro que no te gusta mi modelo. Si lo que quieres es montar un pollo, como tu amiga Ines, no creo que sea este el foro adecuado. This â��peacefulâ�� people was trying a ilegal referendum versus the law.... the police was trying to do their work and they resist.... it was the problem. @Crawler76 Democracy? Stealing urns and repressing peaceful voters with truncheons and rubber bullets? Pedro Caparros (2 years ago) Inappropriate? @mmorao: I have not missed any votes either. That is why I will also vote next Sunday. And who likes the monarchy, the next time the question is submitted to election, to vote for the next Borbon. It's not my case. Hi Pwdro, I was born and raised under a dictatorship, and when that was finally abolished and I was able to vote freely I never missed one election. And I remember well the way Rey Juan Carlos I threw his weight about to hammer democracy into the hard ground of Franquist Spain. What your model shows is is something that saddens me.